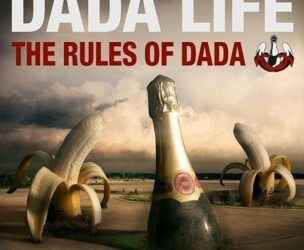 Dada Life announces their new album “THE RULES OF DADA”! With smash hit after hit in 2012, Dada Life has made the dance world go bananas…literally. Now, in the midst of their biggest ever tour – “Dada Land” – Dada Life reveals their new album, The Rules of Dada, will be released on October 16 in North America. It’s packed with a combination of Dada Life’s acclaimed recent singles – “Kick Out The Epic Motherf**ker,” “Happy Violence,” “Rolling Stones T-Shirt” and “Feed The Dada” – and future smashes like “Boing Clash Boom,” “So Young So High” and “Arrive Beautiful Leave Ugly” among others. With an incomparably large sound and wild stage/in-studio antics Dada Life have carved out a niche all their own. Their live show is something to behold; complete with champagne sprays, banana balloon drops, sausage tossing and young BNNS! 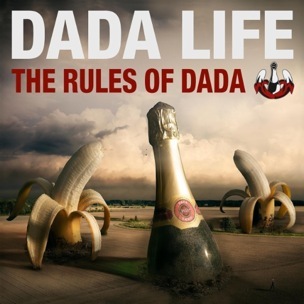 (Dada Life’s fans) all following the Rules of Dada. Fans add to the craziness of a Dada Life show by “Doing The Dada” and showing up in full banana body suits and by bringing along creative props. In fact, these banana costumes are not limited to fans at shows but also the press. During a recent string of interviews in their native Sweden, Dada Life stirred up controversy by demanding that all journalists arrive in full banana costume. Appropriate? Who’s to say? But it’s one of The Rules of Dada and it must be followed. Dada Life is in the midst of “Dada Land,” their largest ever tour. Running for 7 weeks through the beginning of November, Dada Life and their army of Dada’s Little Helpers will take over cities big and small from Canada’s great white north and American college campuses to the bright lights of Las Vegas.